Wash, peeland de-core the apples. Slice the apples about ½ cm thick and place in an oven proof pie dish. Sprinkle the caster sugar over the top. For the topping, mix the flour, oats and Demerara sugar in a large bowl with the butter and rub in lightly until you have the texture of coarse breadcrumbs. Bake in a preheated oven at 180c for about 40 minutes until the topping is golden and the rhubarb mixture is bubbling up. 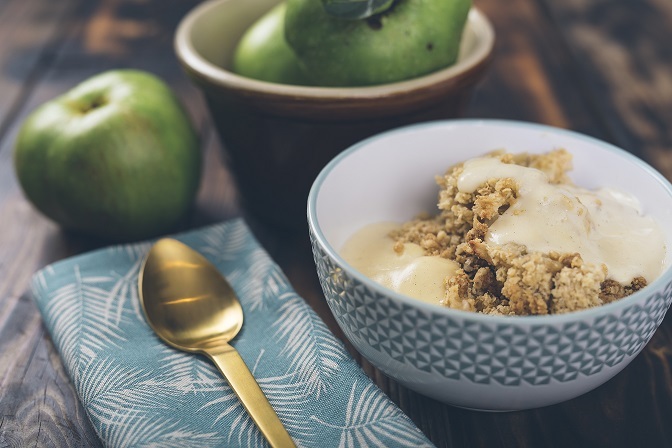 Allow to cool slightly and serve with custard, cream, natural yoghurt or ice cream.